One of the biggest concerns for people in wheelchairs is the portability. They worry how they will get them into the car, bus or even airplane. 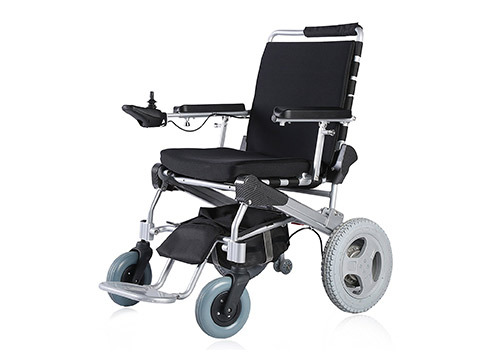 This is why it is a good idea to find the best folding electric wheelchairs for sale. This review will introduce you to the best in the market as per our extensive research on the products. 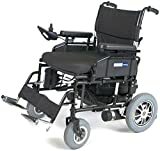 It is important that the chair can be used with the least need for assistance from someone else since there will not always be someone to help you up a ramp or to fold the chair when you get into your car. We also took safety and comfort into consideration especially since you probably will spend a lot of time seated in the chair so it should be comfortable. Here are our recommendations. 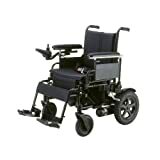 Recommended folding electric wheelchairs. 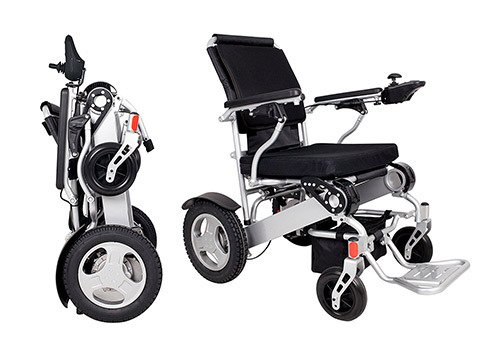 This wheelchair makes travelling a lot easier. It is easy to fold away in just 5 seconds and its build with aluminium alloy makes it lightweight yet still sturdy enough to carry the passengers weight. The battery power lasts long and yet charges fully in just 30 minutes. 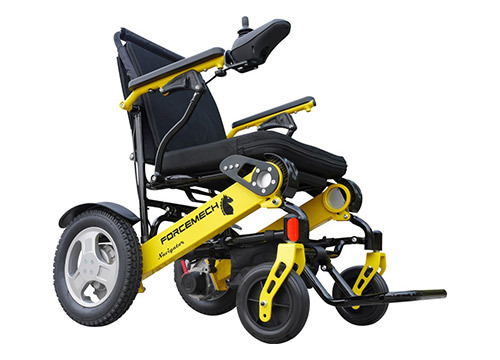 When it comes to mobility, this chair is powered by 2 motors which make it strong enough to handle inclines with ease. It also has high traction wheels for movement over sand or gravel with reasonable ease. One person though complained that the instruction manual is not that great. For safety, it comes with a seatbelt but of course that does not mean you should go speeding along the sidewalk. It folds away easily and can still be pushed when folded. It is a well constructed wheelchair. Heavier people would find this chair comfortable as it can carry a maximum weight of 330 pounds but it also has more sitting space. The chair folds and unfolds really fast and can be stored and carried around easily it also weighs just 62 pounds. It is a chair that is both comfortable and efficient with the ability to recline in 3 different positions. Using this in a house or within a building with many bends and sharp corners should not be a problem as it has good manoeuvrability. The seat comes off so that it can be cleaned and the gear control can be switched from left to right according to the user’s convenience. 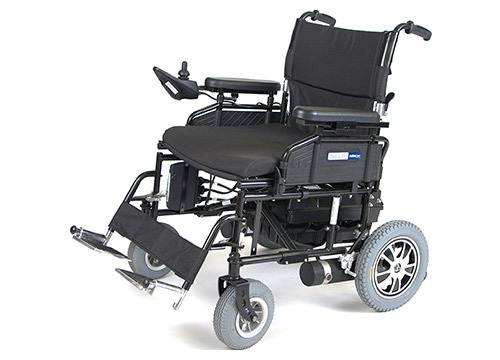 With this wheelchair you are stable on the ground and comfortable in your seat. 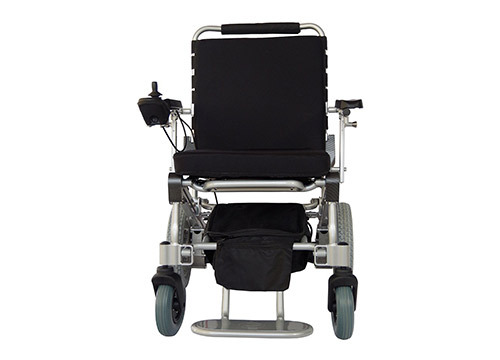 It is constructed with standard anti-tip wheels, the armrest height can be adjusted and the controls are programmable. There is a pocket in the back to carry along whatever the user may need or what the caregiver needs. 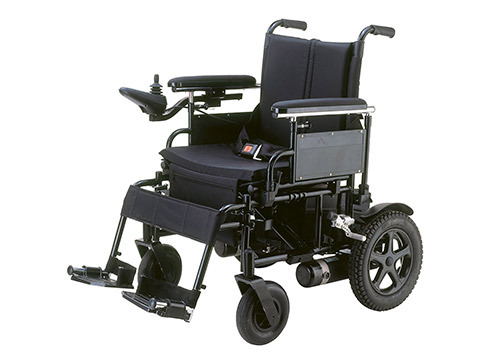 The foldable wheelchair will fit snugly in tight spaces when folded and it is not heavy so it is easy to carry around. The nylon seats are strong yet lightweight and they also allow for breathability. overall, this is a good wheel chair. This is one of the lightest wheelchairs weighing in at only 50 pounds, that however does not mean it is not strong and sturdy. It also folds really quick and can fit in just about any car storage area. Or be carried around. 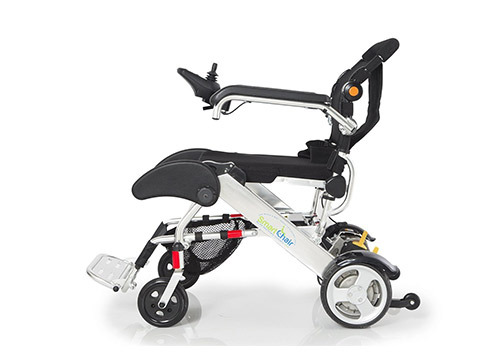 This smart chair can navigate easily through tight corners and the strong motor and battery help it climb up ramps and other inclines up to 12 degrees. If you love mother earth, you will be happy to know that the battery is environmentally friendly but is still able to keep going for longer than 9 miles. This HD chair was designed for easy travel. It weighs just 56 pounds and can fold and unfold quite easily. The battery can go 10 miles on a single charge and you can double that by adding a second battery. The wheels can handle both indoor and outdoor runs. 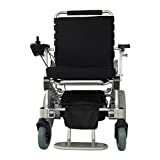 This deluxe model is also quite comfortable and you can adjust the backrest to 5 different positions for better comfort. The armrest can be adjusted. It is quite durable and comes with a long warranty to support that. 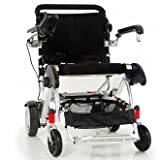 The chair gives the rider comfort and can be easily transported in a vehicle just by disconnecting the battery and it will fold into a compact form easily. It can carry a total weight of 450 pounds so even the overweight people will be able to sit on it. The batteries can give you sufficient distance on a single charge and you can program the controller according to your preferred movement style and speed. The makers of this chair did not spare the padding. Every part that needs to be padded has been padded so that there is extra comfort. It is also made from strong steel to support the rider yet the steel is not heavy which makes the chair easy to transport. This is a safe and comfortable wheelchair, the seat is fitted with a seatbelt to keep the rider on the chair in case of bumps and jacks. Getting around is easy and the speed is reasonable. 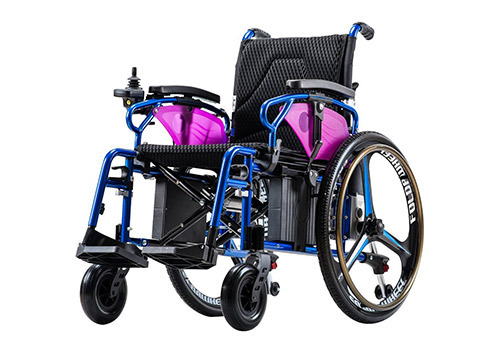 This is the sports car of wheel chairs, it combines good looks, with raw power to give the rider a dependable wheelchair that can go just about anywhere. It is praised for being able to handle any terrain and it will handle sudden weather changes and still get the rider to their destination. Folding it is quick and it can be transported in just about any vehicle. The riders comfort is not compromised by its ragged ability as the seat is still comfortable and so is the backrest. All in all this is one of the best folding electric chairs for sale in . Here is the best of them all, it seems to combine all the pros of different wheelchairs. It has a 33 inch turning radius, it is compact and easy to transport, it saves you from having to spend on a lift for your car and the battery can take you a reasonable distance on a single charge and you can add a second battery to double that distance to 20 miles. It can carry a total weight of 264 pounds. You may also be happy with its airline friendly battery which means you can carry it onto an airplane without any security restriction. This is indeed the best of them all. It is really a tight race here between these 10 and you could very easily pick any one of these chairs and be happy with them. 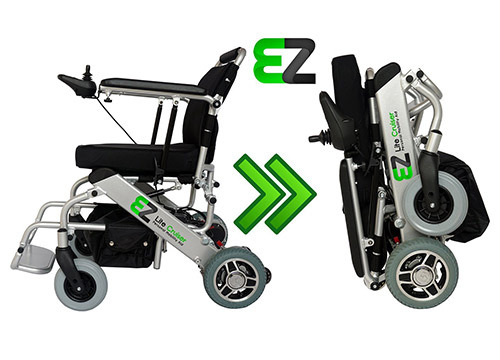 With all things considered however, we would highly recommend the EZ Lite Cruiser for its versatility, comfort and safety as well as portability. You can also consider the Forcemech which is also a favourite for many people and it has its reliability factor in different terrain and weather. In the end, any of these top 10 folding electric chairs would do a good job.